Trump-Putin summit: US seeks better ties with Russia – Royal Times of Nigeria. Donald Trump has said ties with Russia have never been worse” and blamed US politicians, ahead of his first-ever summit with counterpart Vladimir Putin. In a tweet the US president denounced his predecessor’s “stupidity” and the “rigged” inquiry into alleged Russian interference in the 2016 election. The summit is being held in the Finnish capital, Helsinki, later on Monday. Some US politicians had called for it to be cancelled after 12 Russians were charged with hacking on Friday. The twelve Russians are accused of launching cyber-attacks on the 2016 presidential campaign of Democratic candidate Hillary Clinton. Trump will kick off his today’s meeting with Putin alone. 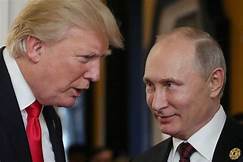 After their scheduled one-to-one private talks, which are expected to last for about half an hour, the two leaders will then be joined in Helsinki by government officials for an expanded summit, before taking questions from US and Russian media in a joint press conference. Paris climate accord: Pope criticises U.S.